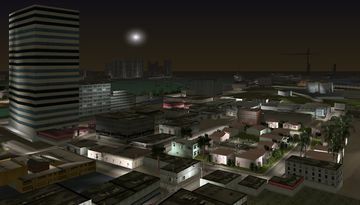 Little Havana in GTA Vice City, as viewed to the southeast at night. Little Havana is a district in the Grand Theft Auto: Vice City and Grand Theft Auto: Vice City Stories renditions of Vice City, Florida. Located in central Vice City Mainland, it neighbors Viceport and Escobar International (and Fort Baxter) to the south and southwest, Little Haiti to the north, and Starfish Island to the east. Boundary defining Little Havana in GTA Vice City. Little Havana is generally a low-rise, low density district implied by name to be an enclave for Cuban immigrants to Vice City, with larger buildings concentrated towards the northeast, and low density commercial and residential buildings huddled to the west. The Cuban flavor of the district is reflected by the presence of businesses with signage utilizing Spanish language, as well as the architectural aesthetics of the southern half of the district. While more dense than neighboring Little Haiti, the district still contains swatches of greenspace in the suburban block to the northwest and around Sunshine Autos to the south. 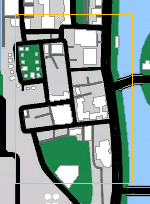 In GTA Vice City Stories, set two years earlier in 1984, the latter is redesigned, relocating Sunshine Autos slightly northwards while a trailer park (the base of operation for the Trailer Park Mafia) is added in parts of the field. Like Little Haiti, Little Havana's eastern shoreline is lined with disused docks. In GTA Vice City Stories, connectivity between Little Havana and Escobar International is substantially improved with a road between the old Sunshine Autos and the road to Terminal A added to cut traveling time between much of Vice City Mainland and the airport. In addition, a wooden bridge is also placed between the road to Fort Baxter and Little Havana's old docks, in front of The Big Package Storage Co.. In both games, the district houses both a Vice City Police Department station as well as a hospital, West Haven Community Healthcare Center, which both serve as respawn points for players who die or are arrested within the southern half of Vice City Mainland. In GTA Vice City, three purchasable assets in GTA Vice City are based in Little Havana, including the Print Works to the north at the border with Little Haiti, the Cherry Popper Ice Cream Factory in the east, and Sunshine Autos in the south. Café Robina will also serve as the contact point for Umberto Robina's mission string, while a robbery at Little Havana's El Banco Corrupto Grande is central to "The Job". Clothing pickups can be found at the local laundromat and Little Havana Streetwear & Tattoo Parlour; in addition, Screw This is also based in the area. In GTA Vice City Stories, the player receives missions from Marty Jay Williams and Umberto Robina in at the trailer park near Sunshine Autos and Umberto's residence just north from Cafe Robina, respectively. Four Empire Building sites are also based in Little Havana, while Stonewall J's, a gun shop, and the old Sunshine Autos are additionally present in the district. The district has seen substantial gang activity in both GTA Vice City and GTA Vice City Stories, having served as a battleground for several gang wars and changed hand between several gangs over the course of the two years in and between the games. In GTA Vice City circa 1986, Little Havana is the Cuban gang's territory. Over the course of the storyline, the district is embroiled in a gang war that sees the Cubans defending their area from the Little Haiti-based Haitian gang, vie for total control of the run-down area. Tommy Vercetti, head of the Vercetti Gang, was recruited by the Cuban head Umberto Robina to help in their turf war, but would later be working for the Haitians against his will. He later proved to be a tremendous ally by helping the Cubans destroy the Haitians' drug factory in Little Haiti, thereby crippling the Haitian's ability to continue pushing into Little Havana. In GTA Vice City Stories, set in 1984, Little Havana is under control of the Cholos gang. The Umberto Robina-led Cubans appear to be feuding with The Cholos for control of Little Havana. At the same time Marty Jay Williams, who operates the Trailer Park Mafia to the south, is also fighting against the Cholos for control of the criminal activity in the area. The area comes under Cuban control when the Cholos' warehouse in Little Haiti was destroyed, leaving them without territories in the area. The Big Package Storage Co. The Little Havana police station. The West Haven Community Healthcare Centre. The Cherry Popper Ice Cream Factory. The Little Havana trailer park. The shortcut between Little Havana and Escobar International. The bridge between Little Havana's old docks and Escobar International/Fort Baxter. This page was last modified on 25 February 2015, at 05:11.